. . . No cookies, No data collection on this site. In recent years, much publicity and fear has been generated concerning the idea of "global warming" / "climate change." Admittedly, there is a fair amount of evidence to indicate a global warming trend has been taking place over the past 100 years. In light of this, a large number of people around the world are convinced that global warming is dangerous, and is caused by human behavior to a significant degree (especially the burning of fossil fuels), and they are urging that sweeping political action be taken to force people to change their behavior and life-styles in order to "save the world" from this feared warming trend. ...However, do the facts demonstrate that this warming is such a fearfully threatening concern, or that it is actually caused mainly by human activity? Before governments and nations become overly anxious, encur a lot of expense, change whole economies, and possibly damage the global climate-balance heavily, we must put the global warming / climate change issue into long-term perspective. -- Of course, this can't be properly done by considering the temperature measurements of a few decades or even a couple of centuries ...but we need to look at many centuries and ideally hundreds of millennia, if possible. Fortunately, such long-term evidence is apparently available, as we consider the following "Paleomap" data put together by Dr. C. R. Scotese, of the University of Texas (See http://www.scotese.com/climate.htm). 1. 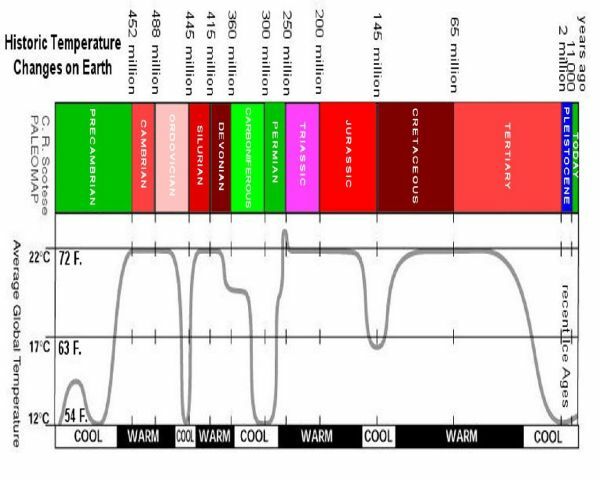 Ever since about 600 million years ago (and probably before), there appears to be an average global temperature maximum of 22 degrees C (or 72 degrees F), and an average global temperature minimum of 12 degrees C (or 54 degrees F) ...except for a "blip" at the end of the Permian period. --The Earth evidently has mechanisms (such as clouds, rain, snow, oceans, plants, and global rotation) which cause a "buffering" of temperature swings, and prevents swings beyond the apparent maximum and minimum. These buffering mechanisms may be "breakable," but they appear to have been in place for at least 600 million years. 2. Considering the total time that all the major phyla of complex multicellular life have been on earth (starting with the "Cambrian Explosion," 550 million years ago), the average historical global temperature has been about 18 degrees C (or 65 degrees F). -- This means that today's average global temperature is near to its lowest historical average ever since complex life has been on earth, which is about 6 degrees C (10 degrees F) lower than the historical global average. 3. Comparing the combined times of having relatively warm versus cool temperatures during the past 550 million years --starting with the Cambrian-- about 20% of that time has been cooler on average, while 80% of that time has been warmer on average. --Ever since complex life has been on Earth, the average global temperature has been at its warmest four times more than at its coolest. 4. Over the past 550 million years, if we combine the periods with coldest (minimum) average temperatures (where the graph holds at 12 degrees C, or 54 degrees F), this adds up to about 10% of the time. --- But if we combine the periods with the hottest (maximum) temperatures (holding at or near 22 degrees C, or 72 degrees F), the global temperature has remained at its hottest about 70% of the time. -- So, during most of the time that complex life has been on earth, world temperature has remained near or at its hottest seven times more than at its coldest. And when the earth's temperatures remain at the coldest, it is for a relatively "short" duration. 5. It is evidently true that the average temperature today is rising -- in which the current "upswing" is only about 1 degree C higher than the global minimum. That is to say, the world has --during the most recent 2 million years-- been "recently" coming out of the "Pleistocene Ice Age" (avg. temp. of 12 degrees C, or 54 degrees F), and ever since the start of the Cambrian (550 million years ago) the global average has normally not stayed at that minimum much longer than that, but has usually been nearer to the maximum about 70 percent of the time. Today's average world temperature is almost at the Ice Age low, near the global minimum. --So: According to historical patterns for the past 600 million years, the average temperature is probably due to go upwards and basically has "one way to go" after the "recent" Ice Age: upwards ... and this historical pattern reaches very far back (about a billion years) before the presence of mankind. 6. Though the earth's average temperature seems to be going upwards, it must still increase by an additional 6 degrees C (10 degrees F) to reach the even the historical average for the past 600 million years. Chart from C.R. Scotese: "Paleomap"
1. During the Cambrian Period, global atmospheric CO2 levels varied between 12 to 18 times higher than they are today (about 400 ppm = "parts per million"), yet average global temperatures held at the highest levels for millions of years; they did not follow the extreme CO2 variation, nor exceed the maximum. 2. During the second half of the Ordovician Period (approx. 35 million years), global CO2 levels were at about 10 to 11 times higher (4000 to 4400 ppm) than they are today (400 ppm), and yet global average temperatures started at the maximum, and then dropped down to "Ice Age" levels --the coldest average (the minimum) temperatures they have been at since higher life has been on earth. 4. During the first half of the Devonian period (approx. 24 million years) global atmospheric CO2 levels increased by 1000 parts per millon (reaching 10 times today's level), and yet global average temperatures remained unchanged --at the maximum average. 5. During the first half of the Carboniferous Period (approx. 37 million years), global atmospheric CO2 levels dropped from 1500 ppm, down to being almost equal to CO2 levels of today (about 400 ppm), and yet average global temperatures still held at about 2 degrees C shy of the global maximum. 7. ... however, through the Cretaceous period, while global CO2 levels fairly steadily dropped from about 2100 ppm down to about 800 ppm (twice today's levels), the average global temperatures started at about 15 degrees C (3 degrees below the median), and climbed back up to the maximum average temperatures ever seen since higher life has been on earth (22 degrees C), and then stayed there for 60 million years. 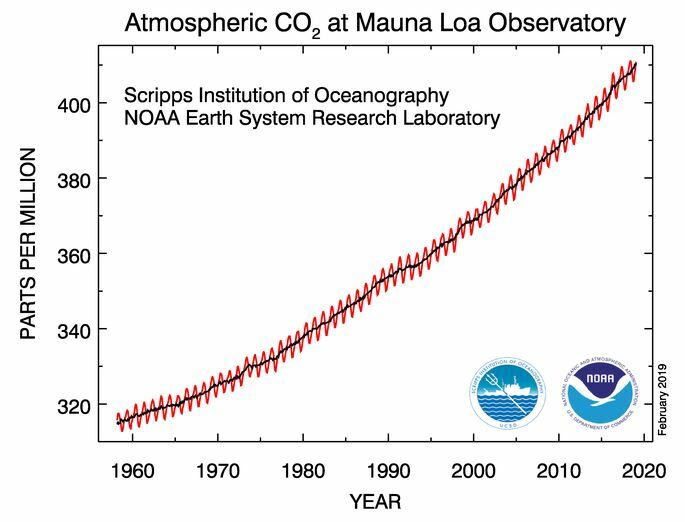 --This may be seen as an example of an inverse relationship (or possibly a non-relationship) between CO2 levels and global temperatures. --Some of this might possibly be because water (in its gaseous and cloud form) is 10 times more powerful of a greenhouse gas --and sunlight/heat reflector (in cloud form)-- than CO2 is. 8. The Earth's average CO2 level for the past 500 Million years has been about 1800 ppm --which is aboutt 4 times higher than it is today. --And, it turns out, that 1500 ppm is an optimum level for the growth of plants (ref. greenhouse levels at: https://fifthseasongardening.com/regulating-carbon-dioxide). Thus, the world today is evidently at a less-than-optimum CO2 level for plants (at 410 ppm) --in fact, plants actually start languishing at 180 ppm, and dieing at 150 ppm and below, and it would be environmentally very dangerous for CO2 to reduce to such low levels. There will always be some who dispute the research and data presented most anywhere. That includes the data of Dr. Scotese, cited above. --Of course, other research is ongoing. One example is the work of geoscientist Douwe Van der Meer, a researcher at Utrecht University in the Netherlands, and lead author of the study which was presented in a 2014 paper published in the journal Proceedings of the National Academy of Sciences. Van der Meer's conclusion is: CO2 levels in the Jurassic Period was 5 times as high as it is today. --This CO2 level given by Van der Meer is approximately equivalent to that cited by C. R. Scotese for the Jurassic (averaged out), and basically confirms his data --at least for that time-period. --(In fact, 5 times today's level is approximately the CO2 average of Scotese's data for the entire Mesozoic). In addition, it is often said that scientists are quite unified that global warming/climate change is an indisputable man-made danger to the Earth. --However, the "Global Warming Petition Project" has been signed by almost 31,500 U.S. scientists (including 9,029 with PhDs), and their statement says, "There is no convincing scientific evidence that human release of carbon dioxide, methane, or other greenhouse gases is causing or will, in the forseeable future, cause catastrophic heating of the Earth's atmosphere and disruption of the earth's climate. Moreover, there is substantial scientific evidence that increases in atmospheric carbon dioxide produce many beneficial effects upon the natural plant and animal environments of the Earth." 1. During the Cambrian period there was a "sudden" appearance of almost all the major classifications (phyla) of life (including all the body-plans of life) which have ever existed on earth --and this occurred with CO2 levels which were 16 to 25 times higher than today's levels, as well as the average global temperatures staying at the highest average levels that higher life has ever seen. Therefore, evidence would seem to indicate that such atmospheric conditions and temperatures do not appear to not be a negative --but may be a positive-- for higher life on earth. 2. In light of especially the Ordovician temperature-drop (while CO2 levels remained quite high), and the Cretaceous temperature-rise which then remained at the maximum for about 70 million years (while CO2 levels steadily dropped), --along with other discontinuities (like the Silurian and the first half of the Carboniferous) mentioned above-- there often appears to be little or no relationship in which global temperatures follow changes in atmospheric CO2 levels in a cause-and-effect direction ...and in fact, perhaps even appearing to be an inverse or non-relationship between CO2 levels and temperatures. 3. Despite relatively high or relatively low CO2 levels in the atmosphere, the earth seems able to maintain an average maximum temperature, above which the high CO2 levels do not make temperatures rise. --The earth evidently has significant temperature buffering/regulating capacity (through things like clouds, rain, snow, oceans and plant-growth) ...which apparently responds to the temperature changes in the atmosphere. 4. 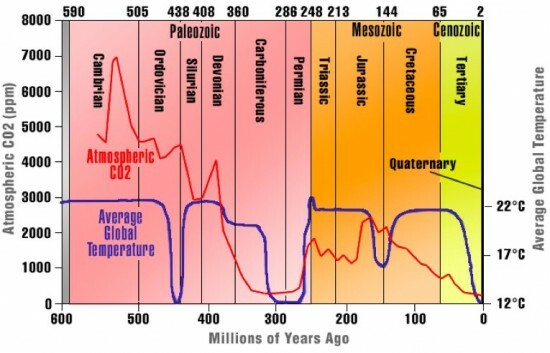 Despite relatively high CO2 levels in the atmosphere (during some periods), something seems able to cause the earth's average temperature to fall to its lowest relative temperatures regardless of high (or low) CO2 (see the second half of the Ordovician period for this). 5. With the above data considered, there often does not seem to be a strong and direct cause-and-effect relationship between CO2 levels in earth's atmosphere and the average temperatures of earth's atmosphere. 7. Certain corals (that form reefs) have been on earth for about 240 million years, and they have grown and formed reefs through the Triassic, the Jurassic, the second half of the Cretaceous, and the first half of the Tertiary --during all of which, the Earth's average temperature has stayed at the average global maximum of 22 degrees C for a total of 200 million years. Since the Earth's corals today are dieing while the average temperatures are only about one or two degrees C above the minimum, maybe something besides the temperature should be suspected as the cause of death. --However, it is reported that corals are showing up in new places. Another factor which should come under very serious consideration is the power of the sun's radiation to directly affect average global temperatures. The well-known rapid and sizeable rise and fall of atmospheric (and climatological) temperatures on a daily (and seasonal) basis --as clearly caused by solar radiation-- should make this solar radiation factor a very obvious front-runner in the issue of such temperatures. Consider this graphic table (to the right), which was put together by Nigel Calder and published in 1998 in "The Carbon Dioxide Thermometer and the Cause of Global Warming." Calder presented this analysis at a SPRU (Science and Technology Policy Research) seminar at University of Sussex, Brighton, England on October 6, 1998. The strength of solar wind was used as a measure of sun intensity. 1. This data covers a period of about 125 years (from 1865 to 1990), which some might consider to be of somewhat limited usefulness in being able to draw conclusions --especially compared to the longer-term data given in the two tables above-- but neither is it insignificant when one considers the sheer power of solar radiation. 2. Still, over the 125-year period, there is a fairly obvious concurrence of average global temperatures along with the varying strength of the sun's activity and radiation ---when the high and low spikes of global temperatures are averaged out. 3. This fairly close concurrence of solar energy strength along with average global temperatures seems to be a good cause-and-effect relationship which is fairly well demonstrated in this table. 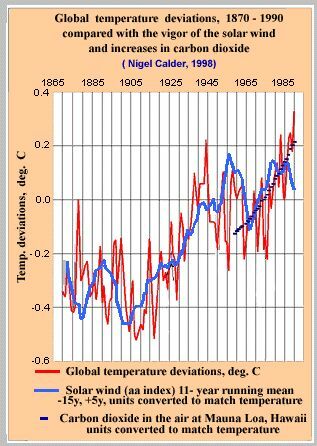 Admittedly, the evidence seems to indicate that some global warming has been occurring over the past century or so, however, it may be more advisable to connect that rise in the average global temperature to the activity of the sun (for example, look up "solar cycles" and "solar maximum") and other factors, rather than primarily attributed to the levels of CO2 (and methane) in the atmosphere. This appears to be true in light of the above data collected by Calder, as well as significant "disconnects" in the relationship of global CO2 in relation to global temperatures, as demonstrated by the data above from Scotese. --At any rate, the rise in temperature may not be largely due to human activity. In addition --since Earth today is evidently emerging out of the average temperature minimum of the "Pleistocene Ice Age," it should not necessarily be surprising or alarming that Earth's average temperature is rising... at least until that temperature is approaching the 500 Million-year annual average of 17 degrees C. --Thus, there does not appear to be risk of an imminent "Extinction-Level Event" --or even biospheric distress-- coming over the Earth, due to a rise in CO2 levels ...even as high as 1800 ppm. Extreme fear of such higher CO2 levels is evidently not warranted. In view of this, it seems wise to avoid doing things which are likely to do damage to whole economies --and ecosystems-- in efforts to force a reduction in world CO2 levels ...especially forcing CO2 levels down too low... since CO2 levels below 180 ppm put plants in distress, and levels below 150 ppm are deadly to many plants --however, plants actually thrive at levels from 800 to 1500 ppm (along with other good soil, water and warmth conditions). ... In addition, it would probably be especially foolish to do something like dispersing man-made chemicals in the atmosphere, or dispersing extensive man-made clouds of reflectors/particulates in high orbit around the earth to reflect solar radiation because it might be very difficult to reverse such a measure, and it might do long-term damage to the environment/climate and to the biosphere ...thereby risking the lives of millions. -- In view of the overall evidence, it seems to be more important that mankind properly manage its forests and plantlife (eg, prevent deforestation) --and vigorously combat environmental pollution, poisoning (esp. of pollinators), trash (e.g. plastic in the oceans), over-fishing, exploitation and destruction of habitats --rather than be overly concerned about CO2 levels in the atmosphere. In a January 2012 letter in the Knoxville News Sentinel, entitled "Global Warming Proven to be Myth," Dr. Arvid E. Pasto (with Oak Ridge National Laboratory), says that human-caused global warming is not substantiated, and carbon dioxide by itself is not a very important greenhouse gas anyway, but water vapor is actually much more significant to the earth's temperature. In 2018, Patrick J. Michaels of the Cato Institute, reported that the rain forests and grass-lands of the earth have been spreading out and increasing at a rate of about 5% per year ...evidently as a result environmental change as well as CO2 increases in the atmosphere. --Thus, some amount of a sort of beneficial "Tera-forming" appears to be taking place on earth, due to these changes. (ref. crtv.com Levin show). The "SCIENCE SPEAKS" newsletter - God speaks through His creation. $1,000,000 Prize for Abiogenesis, Evolution ... & A Challenge for "Scriptures"
Christ's Resurrection ...Fact or Fiction?